* VOC free * Stable from 70°F to 200°F. * EDM, TPO, Metal Roof Patching- withstands extreme roof temps. * flexible...... READ MORE. Click here for a tape comparison chart and "What Tape Should I Use When..."
Learn more about the differences between Polyken 225 Fr and 268 FR at the bottom of this page. Holds plastic sheeting to the wall without harming the wall surface! Coverthermostats, paintings on a wall, window openings, etc. Double-sided tape is like traditional painter's tape on one side, while the other side has an adhesive designed specifically to hold plastic sheeting in tact. This tape is made with paper not cloth, so its a cinch to tear. You can forget the scissors and knives. Single sided aggressive synthetic elastomeric adhesive that bonds instantly to properly prepared polyethylene and polypropylene. 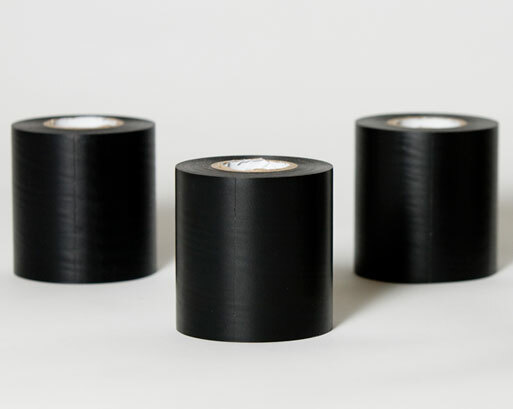 Polyken 268 black FR tape is a medium adhesion Black Color Tape, General-duty, Low chance of adhesive residue on surface when tape is removed. 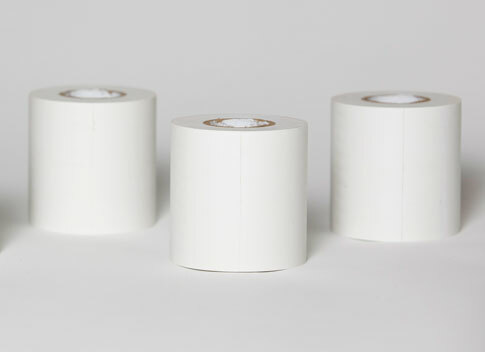 This heavy duty white single-sided tape combines a heavy duty, weather-resistant polyethylene backing with an aggressive rubber adhesive. It provides excellent seaming strength for vapor retarder, cover, and liner applications. Click here for a large selection of Polyken and Patco tapes (often used in aerospace), duct tapes, Fire Retardant Tapes, Waterproof Tapes, Coated Glass cloth, etc. For Nitto Denko Tapes, Please click here. Vapor Tape Plus is a single-sided aluminum foil tape with a release liner for ease of installation. The Fire Test: FR versus Non-FR Tapes under a 2000 degree flame! The Polyken 225FR has significantly more aggressive adhesive than the 268FR. 225 FR works extremely well when seaming polyethylene, sealing containers, permanently taping items where FR Tape is needed. If Polyken 225FR is used on drywall, for instance, it will likely damage the drywall upon removal. On painted metal surfaces, it will adhere quite strongly. It may be difficult to remove, and is likely to leave adhesive residue if removed. Polyken 268 Black FR, was initially used almost exclusively for wrapping vehicle wiring. 268 is not nearly as aggressive as 225FR. 268 can be used on a wide variety of surfaces, and is significantly less likely to cause damage or leave residue when removed. Polyken 268 has been used during US Navy New Build, and Refits. (Both Wetdocks and Drydocks). Because solvent use is severely limited for cleaning residue off painted surfaces, the Navy wanted a tape less likely to leave residue. Polyken 268 works very well with DeckProtek to Tape to the surfaces. If you are seaming FR Sheeting, then Polyken 225FR is the better choice. When taping Sheeting to damage prone surfaces, then Polyken 268 FR is likely the better choice. Question: Can Polyethylene Liners be Repaired with tape? Repairing these liners can be a bit tricky. The best method is welding, if that is possible. There are no glues that chemically bond polyethylene well. GPS have the most aggressive tapes we have ever seen, and have had quite a few customers report good results with either taping tears or holes, or applying patches. If you would be applying a patch, then we also recommend using a double sided, Reinforced Butyl tape, 1.5" x 100' . This is a permanently flexible waterproof tape. Ideally it would be applied to the entire back of the patch, then the patch applied over the area. Then the Perm Tape applied all around the edges. It is important that the liner is as clean as possible prior to taping. Certain cleaners can damage polyethylene, so we always recommend testing a small area well above the water line, or in the anchor trench. If any damage occurs, it happens within minutes, and can be seen visually. Usually using a sponge with the green scrubbing pad on the back works well enough. The liner should also be dry before application.